At a certain point, employing an additional factor of production causes a relatively smaller increase in output. If the variable factor of production is increased (e.g. labour), there comes a point where it will become less productive and therefore there will eventually be a decreasing marginal and then average product. This is because, if capital is fixed, extra workers will eventually get in each other’s way as they attempt to increase production. E.g. think about the effectiveness of extra workers in a small café. If more workers are employed, production could increase but more and more slowly. This law only applies in the short run because, in the long run, all factors are variable. Assume the wage rate is £10, then an extra worker costs £10. Marginal Product (MP) This is the output produced by an extra worker. The first worker adds two goods. If a worker costs £20. The MC of those two units is 20/2 = 10. The 5th worker adds an extra ten goods. The MC of these 10 is just 2. 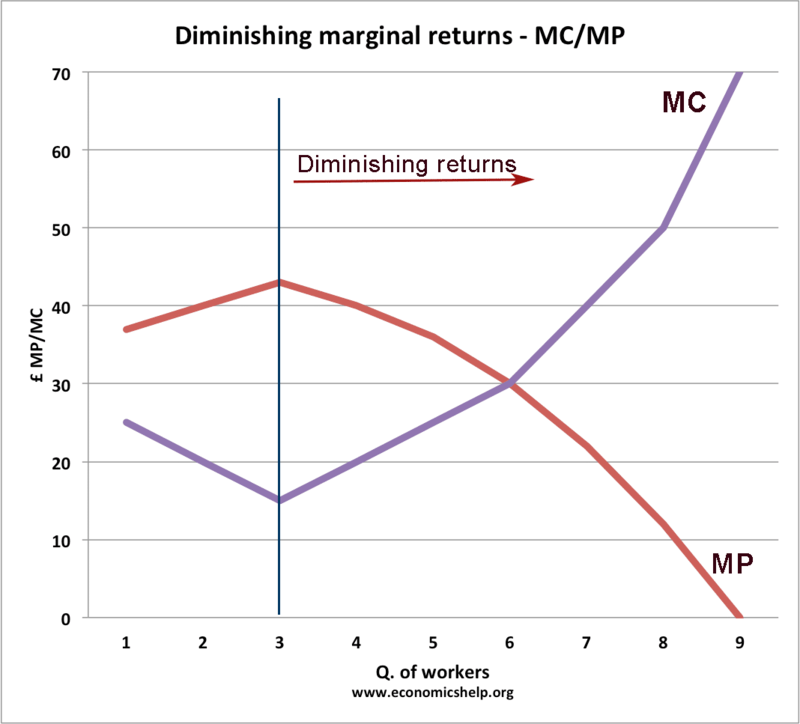 After the 5th worker, diminishing returns sets in, as the MP declines. As extra workers produce less, the MC increases. In this example, after three workers, diminishing returns sets in. After employing 4 workers or more – the marginal product (MP) of the worker declines and the marginal cost (MC) starts to rise. Diminishing returns relates to the short run – higher SRAC. Diseconomies of scale is concerned with the long run. Diseconomies of scale occur when increased output leads to a rise in LRAC – e.g. after Q4, we get a rise in LRAC. 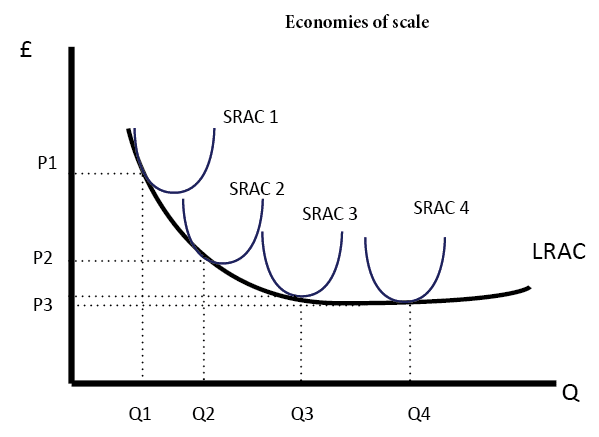 At output Q1, we get diminishing returns, shown by SRAC1. If the factory, increases capital, we can get a different outcome, shown by SRAC2. But, we still get diminishing returns in the short run. Use of chemical fertilisers. A good example of diminishing returns includes the use of chemical fertilisers- a small quantity leads to a big increase in output. However, increasing its use further may lead to declining Marginal Product (MP) as the efficacy of the chemical declines. Revising into early hours of the morning. If you revise economics for six hours a day, you will improve your knowledge quite a bit. However, if you continue to revise into the early hours of the morning, the amount that you learn increases by only a small amount because you are tired. Employing extra workers. A cafe may wish to serve more customers during the busy summer months. However, employing extra workers may be difficult because of a lack of space in the cafe.